The birth of Alexander is shrouded in mystery and legends. He was born in a night to Olympias, the daughter of Neoptolemus, prince of the Molossi, when the great temple of the Asian Goddess at Ephesus was supposed to have been burned down. She was fierce and beautiful7! His father, Philip divorced Olympias and married Cleopatra, thus Alexander was estranged from him and his legitimacy was suspected. Later Olympias murdered Philip elevating Alexander to an advantageous position. Other versions accuse Alexander of patricide. How Alexander died is mystery, though, historians asserted that he was died of a mysterious disease, after the conquest of India! When he was dying, Peucestas and some others of the Companions passed the night in the temple of Serapis and asked the god whether they should convey the sick man into the temple, if haply the might be cured there by divine help, but a voice warned them not to bring him, but to let him remain where he lay! Bury8 characteristically notes that, “such is the punctilious and authentic account of in the Court diary; but it is not sufficient to enable us to discover the precise nature of the fatal disease.” These details are discussed to show that they have no similarity with that of Skanda archetype or Skanda form of worship. Then, how to Interpret Alexander historically on Others? The western scholars have been compromised miserably and proceeded further just to historicize Alexander for their “historical” purposes. Many times, they have to depend upon the forged, concocted and fabricated literature, collectively known as “The Alexander Romance”. Therefore, historians have to be careful in taking such mythical legends for historical interpretations. They cannot try to make mole out of a mountain. Like the Alexander’s invasion on India, the “Alexander Romance” has also been exploited by the westerners to belittle India. Some have tried to interpret that the Skanda / Kanda worship has been developed only from the “Alexander myth”. Therefore, such “Romances turned myths” have to be analyzed critically. The “Alexander Romance” is nothing but superstitious, legendary and mythical narrations developed based on earlier myths and circulated in the name of “Alexander”. This legendary narrative took shape in Egypt, mostly some five centuries after Alexander’s death. Earlier elements and a few facts survive among its wild fiction. Because of the spread of the Romance of Alexander, there are Afghan chieftains who still claim to be descended from his blood. Seventy years ago they would go to war with the red flag they believed to be his banner, while on stormy nights in the Aegean, the island fishermen of Lesbos still shout down the sea with their question,” Where is Alexander the Great?”, and on giving their calming answer, ”Alexander the Great lives and is King”, they rest assured that the waves still subside (RLF, p.26). His only measurement is given in the fictitious Romance of Alexander , where he is said to have been three cubits, or four feet six inches high…….Only in German myth was Alexander was remembered as king of the dwarfs, and it would perhaps be rash to explain his ambition on the assumption that he was unusually small (RLF, p.41). Alexander is said to have been crowned as Pharaoh of Upper and Lower Egypt, an honour only mentioned in the fictitious Romance of Alexander; this crowning cannot be dated to any one month, but is supported by the Pharonic titles which were applied to him in the inscriptions of the country’s temples. As Pharaoh, he was the recognized representative of god on earth, worshipped as a living and accessible god by his Egyptian subjects; he was hailed as Horus, divine son of the sun god Ra whose worship had prevailed in Lower Egypt, and as beloved son of Amun, the creator of the universe, whose worship had flourished in the temples of Upper Egypt and grown to incorporate the worship of the more southerly Ra. This divine sonship fitted him to the dynastic past of the native Pharaohs, for he could be said to share their common father Amun-Ra, who visited the Pharaoh’s mother to father each future king; (RLF, p.196-197). Encyclopedias14 have been cautious in narrating about the Alexander’s invasion of India, because, he never reached India proper. They never record that he conquered India, though they mention about his invasion of India. In fact, there has been a tradition that the Indian forces defeated him and he was forced to retreat. 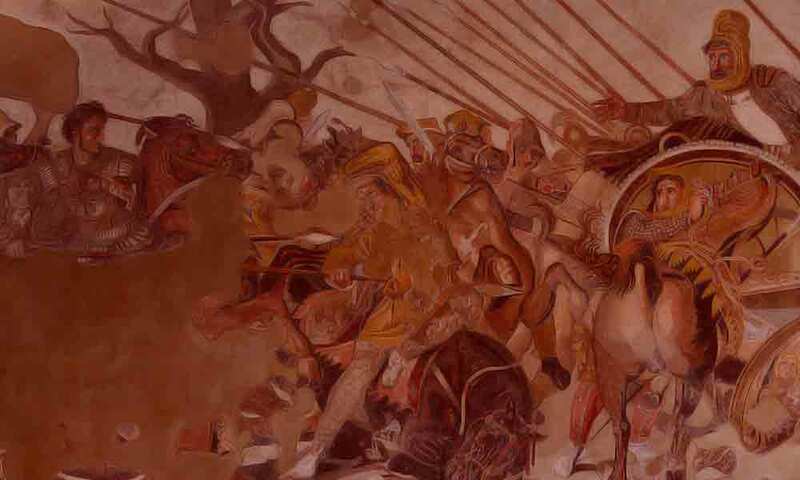 “In the battle of Jhelum a large majority of Alexander’s cavalry was killed. Alexander realized that if he were to continue fighting he would be completely ruined. He, therefore, requested Porus to stop fighting. Treye to Indian tradition Porus did not kill the surrendered enemy. After this both signed a treaty. Alexander then helped him in annexing othere territories to his kingdom”15. Alexander’s ideas concerning India were …still sketchy in the extreme. To the Greeks, the land across the Indus was a shallow peninsula, bounded on the north by the Hindu Kush (it was known as such only in the medieval period) and on the east by the great world-stream of ocean, which ran at no great distance beyond the Sind desert, implying that there were no countries. On the main Indian sub-continent, let alone the vast Far Eastern land-mass from China to Malaysia, they knew nothing. In general Alexander’s ignorance of Indian geography remained profound. His whole eastern strategy rested on a false assumption. When enlightenment came, it was too late. The great Ganges Plain, by its mere existence, shattered his dream more effectively than the army could have done. The Nile and Nila Explode the Myth of Alexander’s Invasion on India: Alexander and Virgil considered and named Indus as Nile. Source: This article is reproduced from the research work of K.V. Ramakrishna Rao, M.A., A.M.I.E., C.Eng(I)., B.L.